I haven’t made bagels in years, probably since 2002 or 2003. I used to make them with my sourdough starter, shaping, boiling and baking at like 5:30 in the morning to have them ready before work. I must have been nuts (says the woman who baked bagels and made hand-pulled noodles all in the same day). 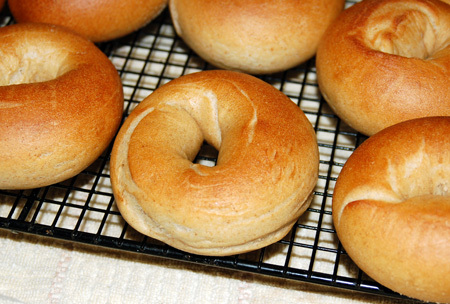 But bagels sounded like a good change of pace from muffins, so I found a recipe incorporating vital wheat gluten for that dense, chewy texture. I really need to get my hands on some malted barley flour or syrup, but until then, I just left it out of my version. My dough was indeed very dense, and I ended up kneading half by hand while the stand mixer tackled the rest and then swapping out, to give both my arms and the mixer a bit of an easier time. In the past, I’ve mostly shaped my bagels with the poke method, but I understand that the more authentic method is to roll each portion of dough into an 8-10″ snake and coil the ends on top of each other, rolling against the counter to form a good seal. This was the way I shaped my bagels this time, and I am happy to report that I had no seal breaches when it came time to boil and bake. I also appreciated the fact that this recipe calls for shaping the dough the night before, saving some time in the morning. Once boiled, my bagels baked up to a gorgeous, shiny golden brown. I pulled them out of the oven just as my son woke up, and he immediately tried to get his hands on one. When I explained that they were still too hot to eat and we would have to wait a little while, he flipped out, rejecting homemade peach butter muffins and chocolate Cheerios alike. 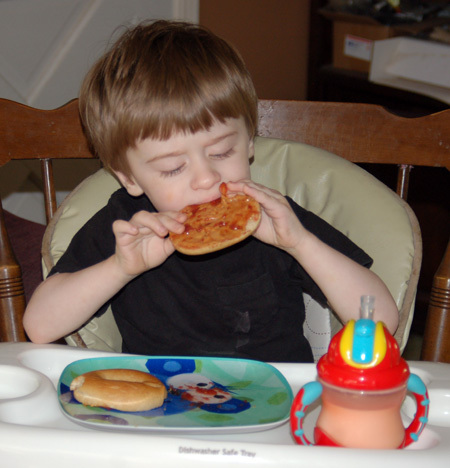 Only Mama’s fresh bagels would do, slathered with peanut butter and strawberry jelly, if you please! The poor child has such a rough life, lol. Wow! I’ve been wishing for a good bagel recipe. I’m not really pleased with mine. I never even considered trying sourdough! 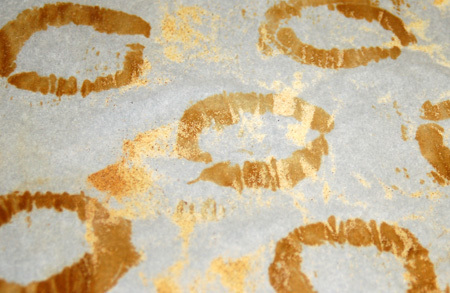 Did you use any whole wheat flour? 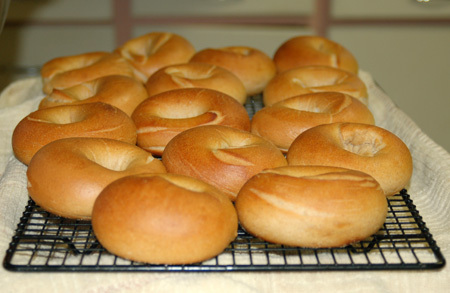 If my bagels would get even half as lovely as yours – I’d be thrilled! Gina, I used all-purpose flour from Eagle Mills, which contains something called “Ultragrain” (I think it is their particular branded strain of white whole wheat). My sourdough starter is 50/50 ap and whole wheat flour, so there’s always a little extra whole wheat coming into play from that. Probably at some point I’ll have to do a whole grain cinnamon raisin version for my husband though. 🙂 The vital wheat gluten makes all the difference in texture, but I really need malt powder to get the taste right; I couldn’t taste the sourdough at all. I’ll be waiting for that whole grain cinnamon raisin version!